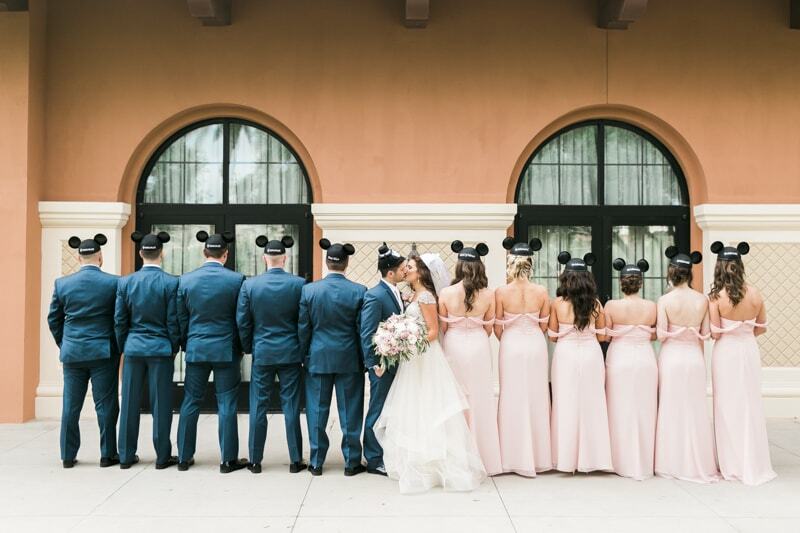 Disney Themed Wedding in Las Vegas. Once upon a time, in a land far, far away, Brianna and Dan had a Disney-themed wedding that was a fairytale dream come true. 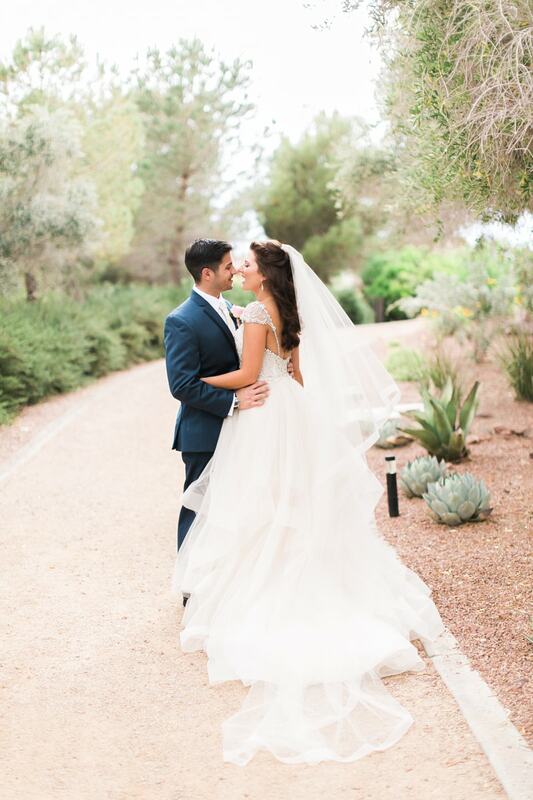 But this wasn’t any mouse-filled, pixie-dusted affair because their big day was filled with posh and stylish Disney influences that came together in a tasteful and romantic way. So, why Disney? The couple first met on a flight they shared to Nashville. Casual conversation led to the discovery that both were visiting Disney World within a few days and their families had an affinity for the ‘happiest place on Earth.’ That conversation eventually led to the exchanging of business cards, which ultimately led them to an engagement nearly two years later. 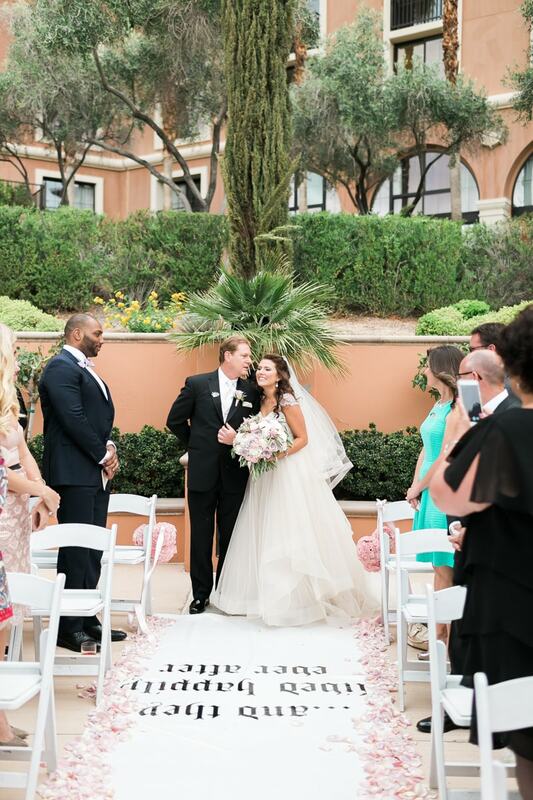 They wed at the Westin Lake Las Vegas Hotel in Henderson, Nev. 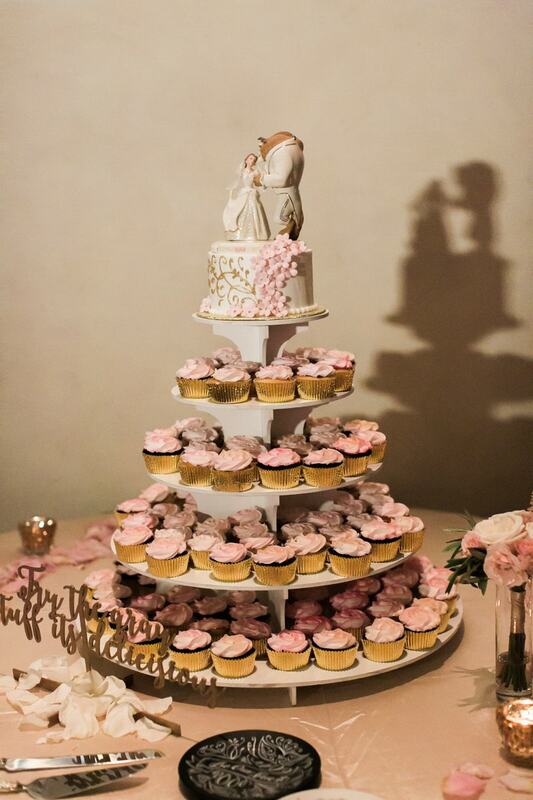 The day centered around a romantic color palette of soft blush and white with a special attention to the Disney classic "Beauty and the Beast." 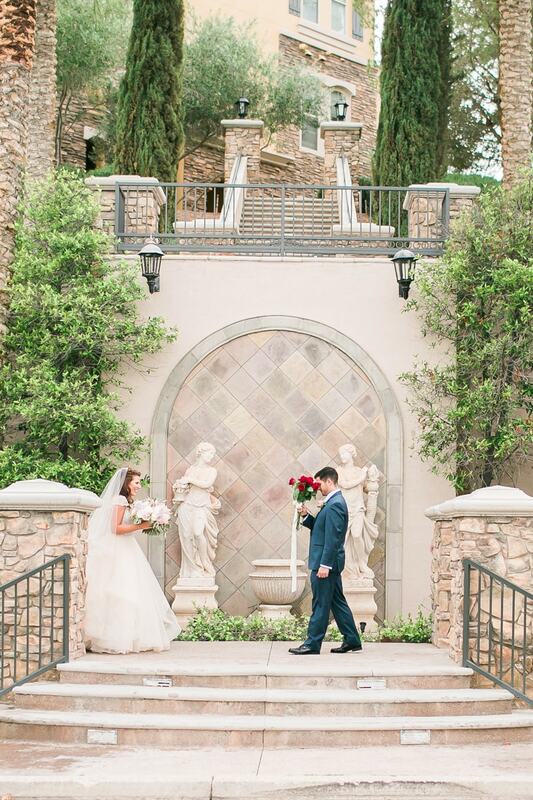 Their first look was planned at the bottom of a double staircase outside. As Brianna anticipated Dan’s reaction, he covered his eyes with a bouquet of flowers to wait until the last possible second to see her. Their reactions were filled with delight and excitement. They paused on the steps and slowly strolled the property together for more pre-ceremony photos, including fun ones with the bridal party. 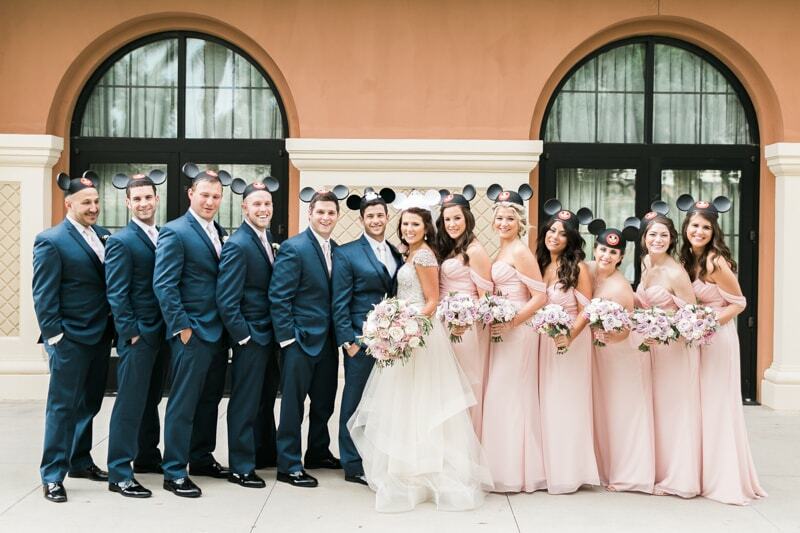 The groomsmen and bridesmaids all donned personalized Mickey Mouse ears for an adorable bow to the theme of the day. 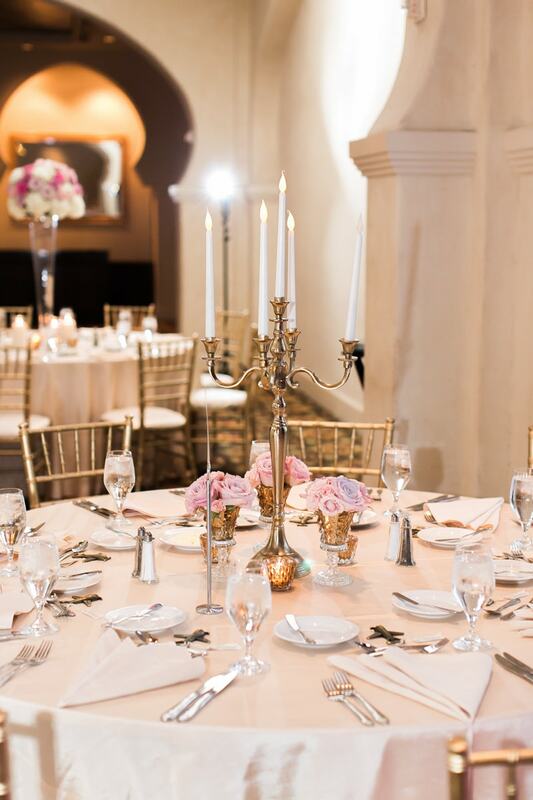 When guests first laid their eyes on the ceremony space, they were greeted with a personalized aisle runner which read “and they lived happily ever after.” They also gazed upon rows of crisp white chairs, rose petals flanking the aisle, and a gazebo outfitted with white fabric panels and floral arrangements. 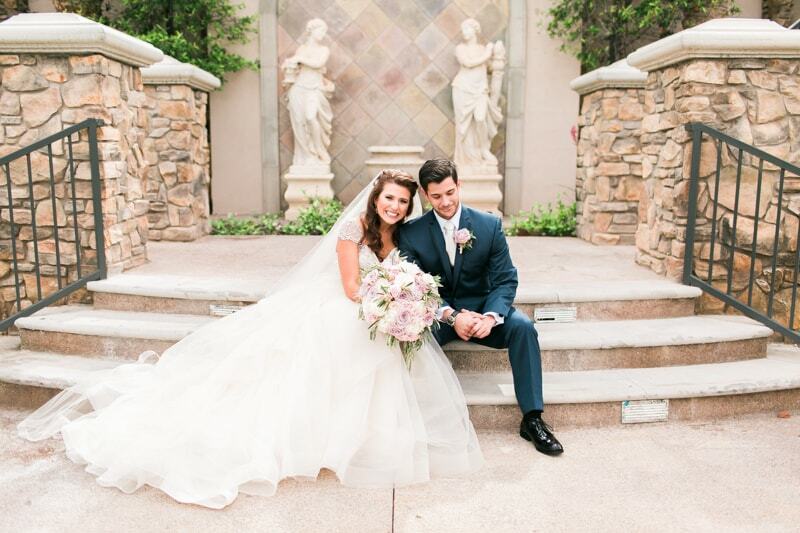 They joyfully said “I do” in front of their family and friends under a warm, sun-filled sky. After the ceremony, it was time to celebrate. Guests were in awe at the attention to detail the couple took with their venue. The ballroom featured swags of fabric draped from the ceiling to the columns, star-shaped lanterns, and romantic round tables. 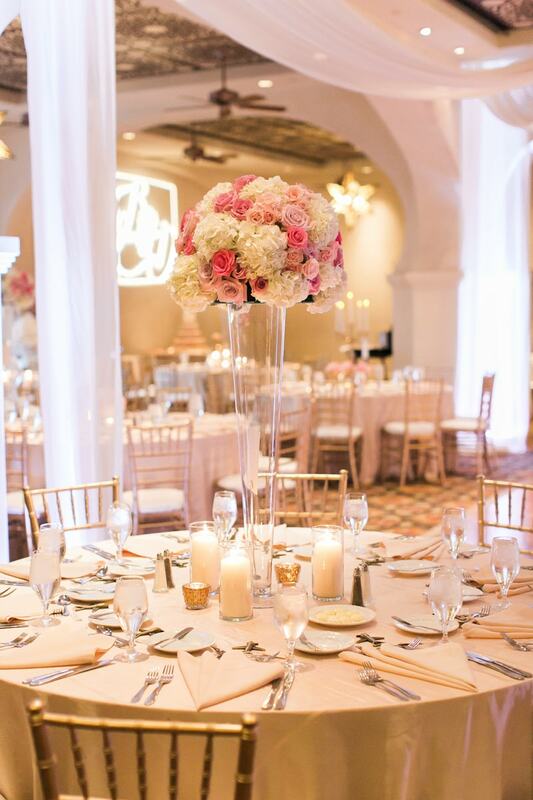 The tablescapes included ample candlelight and tall clear vases filled with pink and white roses and white hydrangea, and of course, candelabras. They also recreated the film's library scene with scores of vintage books displayed in a most unique fashion, along with its famous Candelabra and Teapot. Even their cake reflected their fun and fabulous theme. 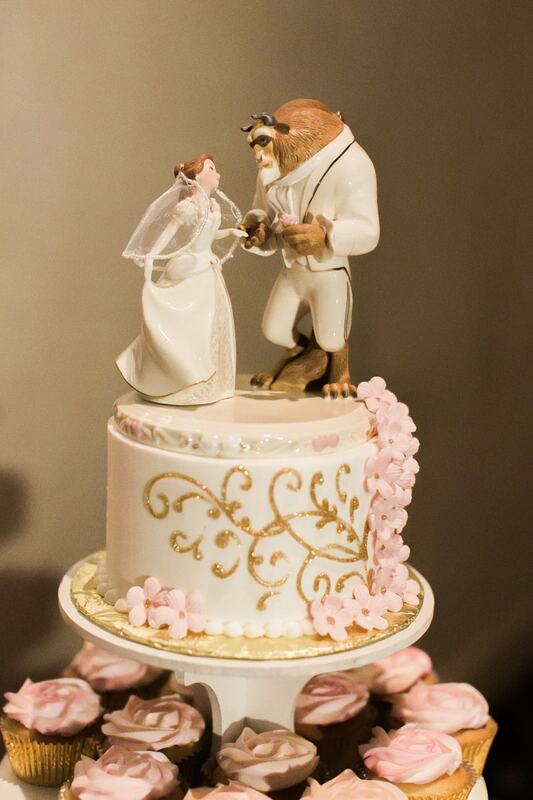 The small gold and white creation was topped with figures of Belle and the Beast in their wedding day best. Pink buttercream-frosted cupcakes were offered to guests, as well. As the couple took their first dance as husband and wife, they beamed with happiness. Brianna’s skirt swooped across the floor, much like Belle’s does during her dance with the Beast. And the couple even regaled their guests with a choreographed duet, as well!